When we try to find out the roots in an equation, especially in case of a trigonometric equation, there can be several cases. it is extremely important to be careful while carrying out various algebraic operations because there are instances when we can cancel certain roots while sometimes we cannot. sin θ[A] = sin θ[B] where A and B are trigonometric functions. Hence, particularly in case of trigonometric functions, the cancellation cannot be carried out directly. The literal meaning of extraneous is extra. When we perform the operation of squaring, we may get some extra roots. So, especially in case of trigonometric functions, squaring should be avoided as far as possible and even if it is inevitable, one must check for the extra roots. Solution: We know the relation sec2 θ = tan2 θ + 1. So we can utilize this relation by squaring both the sides of the equation. Remark: It is important to note here that all the solutions obtained are not the solutions of the original equation but of its squared form. Since squaring yields many extra roots so it is essential to check out the actual solutions of the original equation. True only when n is even. Hence for odd n, an extra solution has been obtained which does not satisfy the original equation. So, it should be excluded. Remark: Sometimes the question demands the solution in a particular region. In that case the roots which though are solutions of the original equation become extra if they don’t lie in the specified restricted region. Solution: The given equation is 3sin2x – 7 sin x + 2 = 0. This can be written as 3sin2x – 6 sin x - sin x + 2 = 0. Hence, (3sin x – 1) (sin x - 2) = 0. There are six values of x ∈ [0, 5π] which satisfy the equation 3sin2x – 7 sin x + 2 = 0. Look into the Revision Notes on Trigonometry for a quick revision. Various Recommended Books of Mathematics are just a click away. 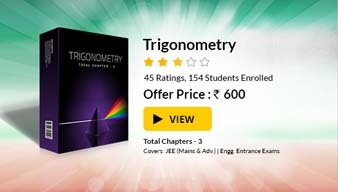 To read more, Buy study materials of Trigonometry comprising study notes, revision notes, video lectures, previous year solved questions etc. Also browse for more study materials on Mathematics here.